Neural stem cells pre-treated with metformin integrate into the brain and give rise to new neurons. 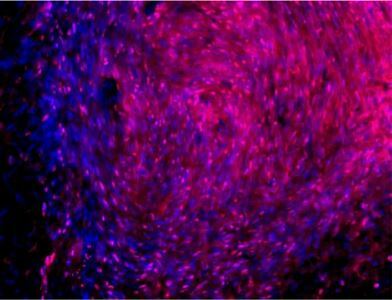 Transplanted neural stem cells and their daughter cells are shown in red in this section of rat brain. Photo by Fares Ould-brahim in Dr. Jing Wang’s group, reproduced courtesy of the journal Stem Cells and Development, published by Mary Ann Liebert, Inc., New Rochelle, NY.Imagine removing blood or skin cells from a patient after a stroke, turning them into powerful stem cells in the lab, and then transplanting them back into the same patient’s brain so they can give rise to new neurons to repair the damage. This is the promise of induced pluripotent stem cell (iPSC) technology, and new research led by Dr. Jing Wang could help make it a reality. Dr. Wang and her team discovered that metformin, an established diabetes drug, can stimulate neural stem cells derived from iPSCs, helping them integrate into the brain and give rise to more neurons. In a stroke model, animals that received metformin-treated neural stem cells showed signs of increased regeneration in the brain and had faster recovery of gross motor skills compared to animals that received untreated cells. Future research will examine if other combinations of stem cells and drugs could be even better. See Stem Cells and Development for details. Authors: Ould-Brahim F, Sarma S, Syal C, Lu K, Seegobin M, Carter A, Jeffers M, Doré C, Stanford W, Corbett D, Wang J.
Funders: Dr. Wang’s research is possible because of generous donations to research at The Ottawa Hospital. This project was also supported by the Heart and Stroke Foundation Canadian Partnership for Stroke Recovery.